Our contributor, Erica OBrien, is back for the next post in our Trending series. Join Erica as she goes from inspiration on Pinterest to cake concept and then the final cake design. The theme of my monthly posts on The Cake Blog is design trends. The trends can come from anywhere—fashion, textiles, food, housewares, architecture, etc. Some months, the inspiration comes easily, and everywhere around me I see trends just begging to be turned into cake. Other months, when nothing is jumping out at me, can be a bit more challenging. This was one of those months, so I reached out to Carrie, editor of The Cake Blog, for some ideas. She suggested watermelons, which, I have to admit, did not immediately excite me, but after exhaustive research (also known as a Pinterest search ), I was more than sold: I was psyched, I was inspired, I was in love. The best part of my partnership with The Cake Blog, hands down, is the opportunity it gives me to create cakes I love. I’m very invested in all of my designs, but when I’m working with a client, I’m creating their vision, incorporating their aesthetic, and matching their color palette. 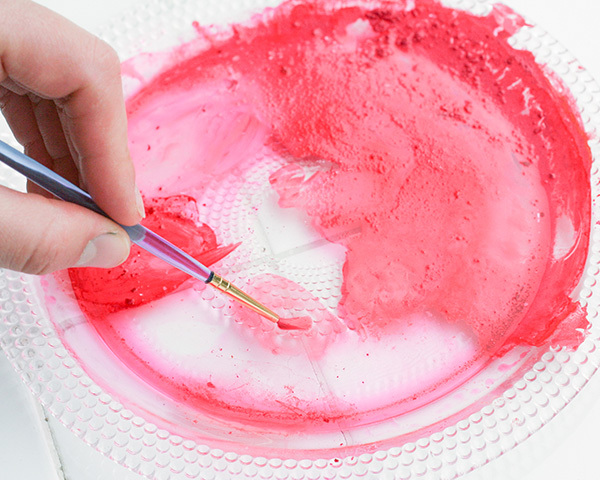 When I design for The Cake Blog, I’m designing for me: my colors, my style, my artistic interests. And to that end, I absolutely love this cake. For the top tier, we printed a template and then used it to cut the words out of gumpaste using a scalpel (scalpels are sharper than xacto knives), and adhered them to the cake with edible glue. We allowed them to dry overnight and then painted them using the same watercolor technique we used for the watermelons. The slice on top was also cut out of gumpaste and allowed to dry overnight. 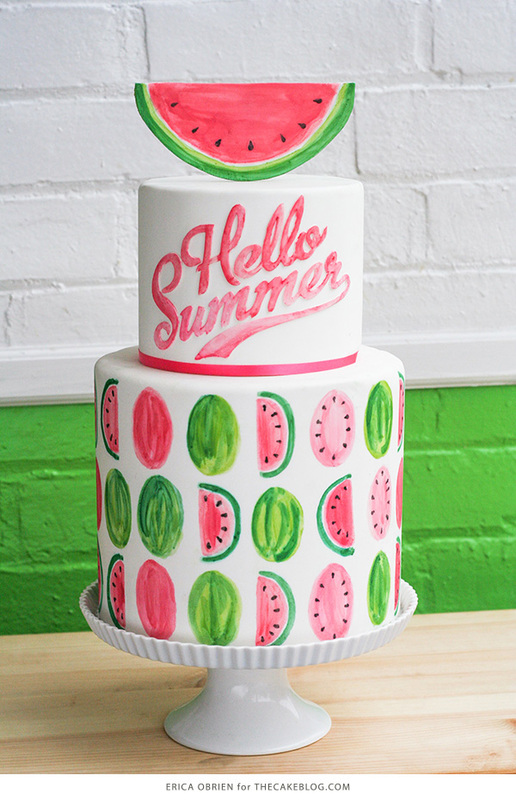 We then hand-painted the watermelon using the watercolor technique and affixed a popsicle stick to the back with more gumpaste before inserting it into the cake as a sort of topper. 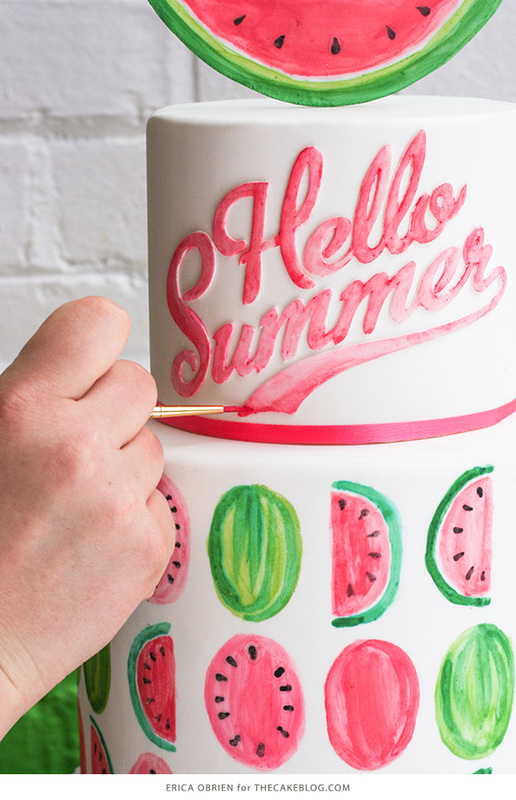 I love how the retro vibe of this cake feels absolutely contemporary and perfectly summery. The transparency of the watercolor really gives the design a weightless look that would feel much heavier if it had been done in opaque colored fondant. 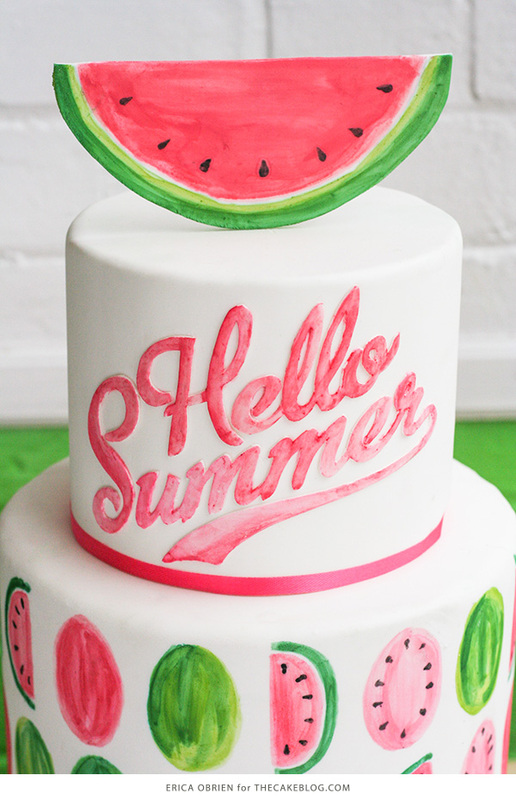 The typeface we chose works perfectly, and the watermelon topper is the exact right tough of whimsy. Basically, I’m in love. I hope you are too. Erica OBrien has been a cake designer (and avid cake stand collector) for almost twenty years. She lives in Connecticut with her husband and two spunky daughters. Read more about Erica on her bio page. Super cute cake! I haven’t had much luck finding a good scalpel. Could you recommend one? I love this cake! What is the font used? this is just adorable! So creative. I love this so much!! I noticed that they’re perfectly aligned. Did you use a ruler? It is a perfect cake for any occasion.Looks so delicious and creative. Erica you are such a cake genius! Always so fresh and modern and fun. I’m such a fan of this watermelon cutie! 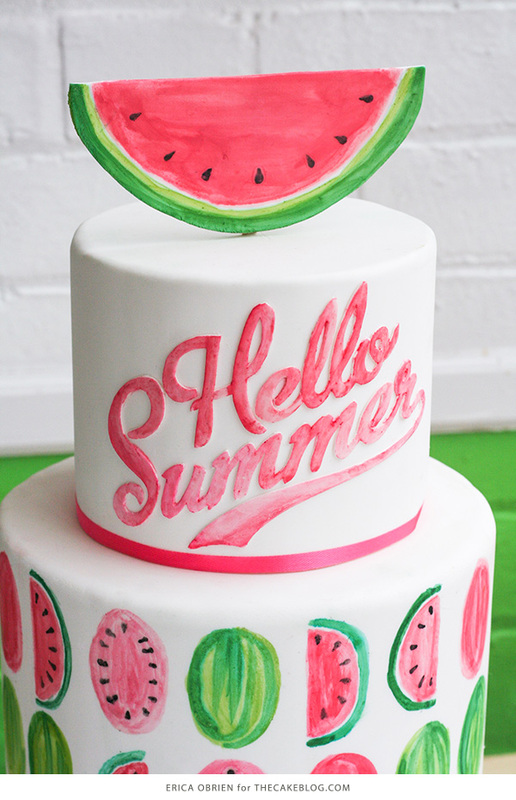 I love this watermelon cake. So original. 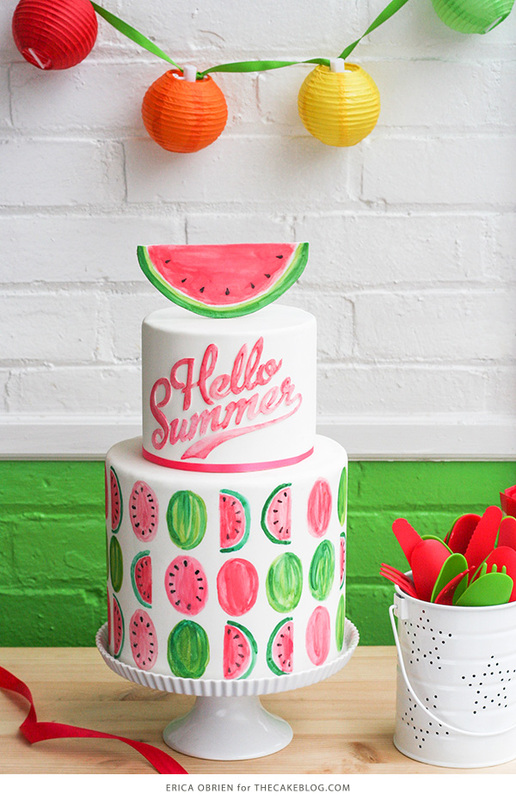 And anything decorated with watermelons is alright in my books. very cute idea. I’m in love with the watercolor texture. 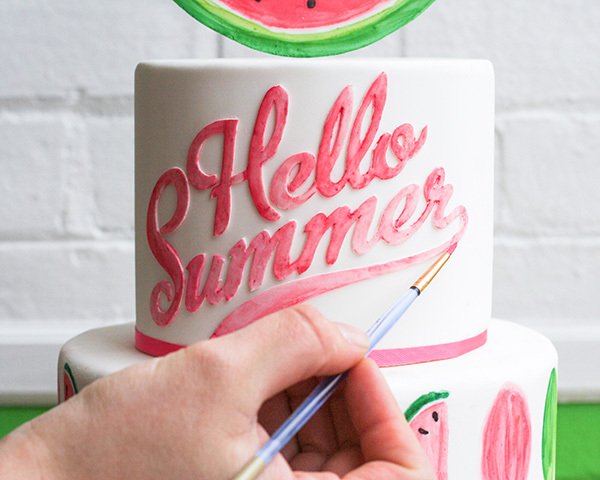 I paint and just blows me away that this was created …looks too good to eat and the letters beautiful!!! !